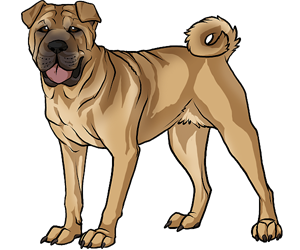 The Shar-Pei's ancestory is uncertain, though art suggests they could date back as far as 206 BC. They were used by the Chinese for farming, guarding, herding, and hunting. They also had advantages in dog fights, for their loose, prickly skin was hard to grasp onto. The breed was recognized by the AKC in 1992. The Shar-Pei is sensitive to warm weather due to their wrinkles holding in heat. The Shar-Pei doesn't have an undercoat.